This past weekend, the neighborhood of Lavapies hosted a streetball/basketball tournament for young people who had travelled from all over the world. With this, the barrio bounced to a new beat. I was surprised to see the turnout of Madrileños, and the number of people interested in the hip-hop/street culture of NYC basketball. It was a well-organized, interesting event, complete with freestyle hip-hop music (MC Carlitos Wey), film (Samantha Casoleri) and photography (Patrick Buckley). This event was organized by Jose Gonzalez, director of Lenguaje Perfecto. When extranjeros first think of Spain, most visualize imagery of bull fighting, flamenco and sangria. Although these are customs that have been treasured (and over-sensationalized in the media) for decades, times are changing. With each new generation, each new group of immigrants, and each new song uploaded onto YouTube, young Spaniards are re-inventing the rhythm of Spanish culture. Events such as the "Streetfest" resonate with young people here struggling to find employment and a better way of life, just as streetball played an important role in the development of African-American culture in LA and NYC. Hip-hop, breakdancing and graffiti are all means of expression that allow people to interact within their peer groups in the cities. 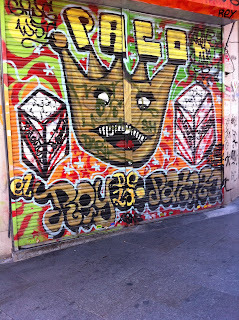 Graffiti is all over the city, and all over Spain. Although many murals are simple scribble, others are works of art. On any given day here in Madrid, you can walk down the street and see young Spaniards rapping with their earphones on, or cars passing by blasting Eminem. A cultural event with influences of America allow Spaniards to travel without moving. This event was an insider's glimpse into the influence of street culture in the city of New York. In turn, it was an opportunity to take note of similarities and differences that exist in both places. It is important to note that Lavapies is a neighborhood with a strong character and personality. If you walk its streets you will find street art, graffiti, small cultural venues, and families using the public space to fully interact with the city. Lavapies is an example of street culture in development; a barrio with a flavor for every type of person. Like young people in America, many young Spaniards are frustrated by the economic situation. The newspaper El Pais recently reported that 21% (in the first quarter of 2011) of the nation is unemployed (9.6 million people). 95% of these people are between the ages of 18-30 (9.1 million). New laws have been passed making parents responsible for their adult children until the age of 27! People are looking to the government for support, but there's only so much the government can do. Events like "Streetfest" can inspire young people to use their talents in athletics, art, music or whichever medium of expression to share their thoughts and concerns and influence change in their individual neighborhoods. This in turn will have a long lasting effect on the country overall. Streetball is exactly what the doctor ordered to cure disenfranchised youth.